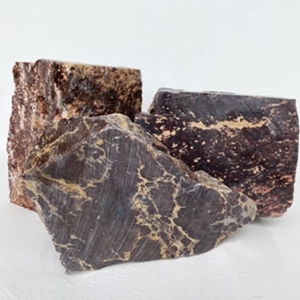 This beautiful imported soapstone has a somewhat "speckled" look with colors of red, black, purple and cream running throughout. Since each cut piece is unique, the extent of these colors will vary from stone to stone. The flow of the colors can dictate how you will carve your piece. It is a harder soapstone than most but carves easily and is polished with little effort. Gala Coke Soapstone - 4 lbs. Gala Coke Soapstone - 8 lbs. Gala Coke Soapstone - 10 lbs.